Skyrrahh's review (This content has been automatically translated from French)" Gibson invented the tremolo for Marshall"
And the highlight of the show: a "vibrato" (other) Sideway, a strange contraption. As stated above, I prefer the slim profile Rounded Rounded but it is very enjoyable to play. Weight Sideway well compensates the small weight of the head (compared to the 12 strings) and suddenly it is very stable and is well in position on the thigh, and yes I play seated. Good on the other hand, it comes in 009/046, and there me I have a lot of trouble, I've passed the 010/046 c is already places but the next c is 011/048. The Sideway, so that's what this thing, I think it is more of that tremolo vibrato. For cons, the magic appears when the low hand you operate the handle in waves like that by chance is flat, and you get a kind Fender tremolo or the odd chorus (Univibe) which is the 2nd effect the Rotovibe Dunlop. The same result with the speed you like for it is your hand that the pace of chorus. Quite dispute of vibrato stratovolcano, also of the springs being mounted inversely to the action of the stratovolcano, which confirms that it is rather up and down that it must operate the. The rendering is really nice and different from the standard vibrato. The classic 57! What killer! Big sound gibson like in disks that I love! Severe hearts and I do not even have it on my Marshall tried again. D Also, if I win the lottery, I pay 2 classic 57 for 12 strings. Less than a week of use, that happiness except the ropes yet. The sideway is trying everything depends on everyone but hey I spend my life playing with a vibrato so c is a plus. Very beautiful violin and color rather than cherry mahogany in the strict sense. 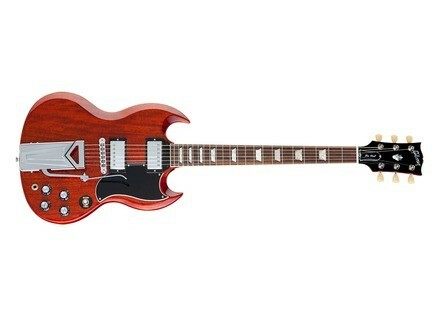 This is not the cheapest Gibson, but far from being the most expensive and also not bad equipped. Result: rather really happy with the gift that I did! If I do not put 10/10, c is because it lacks the historical and the manual for the sideway. And I am not convinced that the sideway can really be called a vibrato, tremolo effect I would say. Yeah, but ballo c is a perfect thing to be perfect! Chris-Rock's review (This content has been automatically translated from French)" A "Must Have": Run buy!" SG guitar type manufactured by Gibson USA. The handle has a "slim" profile identical to the SG 61. The key, in one piece, is solid rosewood "Grade A", it is surrounded by a beautiful cream-colored binding, which adds to the effect "vintage" guitar ... The handling is easy and pleasant and appearance of the handle and the key contribution to the side "noble" of the instrument. By buying this instrument, I asked myself especially questions about vibrato SIDEWAYS: The model 1961 has a very bad reputation, he was known to systematically tune the guitar ... as to be permanently removed from the market after 2 years! Our model "Les Paul Tribute LTD", that vibrato was revisited in order to function correctly. After several trials, taking care to place the graphite nut, I confirm: It seems vibrato actually keep well agreement! Another notable feature of SIDEWAYS: It acts on the lever upwards, vertically, then usually, on the other vibrato motion is horizontal. The SIDEWAYS also helps balance the SG: It has less tendency to "nosedive" The weight of the guitar is very rsonnable (about 3.3kg).. And finally, this beautiful chrome piéce gives it a beautiful look 50 ... close to the original 1961 model ... Certrains purists regret replacing the ABR-1 bridge from the original version by the Nashville or absence of double rings the mechanical key. These details will not ultimately change the aesthetics of the guitar and, above all, do no affect the sound reproduction of the instrument! Meanwhile, when you know the "Classic 57" Gibson, one is not surprised there was a REAL famous PAF who makes the reputation of Gibson since decades. Nothing to say: This is the legendary Gibson equipped with humbuckers. It's beautiful! To summarize: Zero defects, look fabulous, a époustoufflant sound, original and functional vibrato ... An exceptional instrument for obordable price: Run the purchase, there will not be for everyone This is a limited edition!